When organizing trips on their own, we often include sleeping in the field. It is an economical option that holidaymakers use, holidaymakers, trappers, anglers, climbing enthusiasts, grottos and speleologists (cave explorers). An important part of an adventurer's inventory in nature are accessories for sleeping in the field. One of the most important elements of the equipment is a universal, very resistant to damage and a rain-proof cloth made of polyester. Each preppers, a traveler and a hitchhiker have a good quality camping sheet at hand. It is also very popular among festival participants. Free time can be used in many interesting ways, one of them is immersing yourself in Bushcraft techniques, or the art of survival. It is an amazing adventure, as well as practically preparing for catastrophes, wars or ecological disasters. 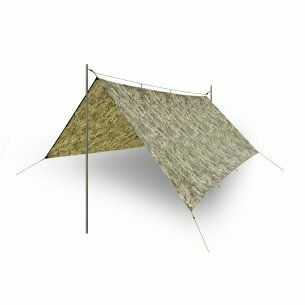 One of the most important elements of the bushcrafter equipment is a camping rug that can become a part of the protective structure or it can be used to make a makeshift hammock or backpack. In a word: the universality that supertrap provides is noteworthy. After getting acquainted with the multitude of applications the bivouac cloth offers, we will always consider it when preparing the equipment. A good quality camp cover made by Helikon Tex thanks to camouflage colors is eagerly chosen by hunters, foresters and biologists, because it allows you to hide in the forest lanes and remain unnoticed by the game. Supertrap z is made of durable material and solid fastening elements. For people interested in survival and bushcrafting techniques, sleeping in the field is something natural. In order to be able to quickly and effectively construct a shelter for sleeping or keeping food, it is worth having such sleeping accessories on hand as a camping cloth. Its resistance to abrasions allows for many years of effective use. It is worth to buy it at the very beginning of the adventure with survival. Using this type of elements and exploring Bushcraft techniques develops such features as: speed, agility, smartness, creativity and efficiency. Only people with such features will survive the time of danger. It does not matter if sleeping in the field is associated with high temperature, high dustiness, drizzle or rain - supertrap is also useful in difficult conditions. Polyester does not absorb water, so you can check the terrain during atmospheric precipitation. In addition, during high heat, a bivvy cloth will help you to take shelter from the harmful effects of sunlight and windy, unfavorable weather. Supertrap can be used as a hammock, sun protection, makeshift sleeping bag, tent or tipi element. It can also be a replacement or an extra super durable backpack or sack. The application of the supertap depends largely on the imagination of its owner. Thanks to the natural colors imitating the colors of nature, such as: brown, khaki, camogrom, olive green, camo and woodland, a bivvy cloth will help us hide from wild animals and remain unnoticeable to other people. It is very easy to store, fold, unfold and clean. It can easily be packed into a backpack and expanded if necessary. The sheets offered by the manufacturer of Helikon Tex military accessories can be purchased at a very attractive price in relation to their quality. It is worth to take an interest in a well-timed, important element of equipment, such as sleeping accessories in the field. It is enough to have several lines, herrings, cords and a camping sheet at hand to create a great, reliable protective construct in the field.